Following a tutorial I'm trying to get a cube to patrol in 3 points. I created an array, made its size 3 and added all the patrol points. I added printf to attempt to debug. I have no idea why it keeps setting the array size to 0. 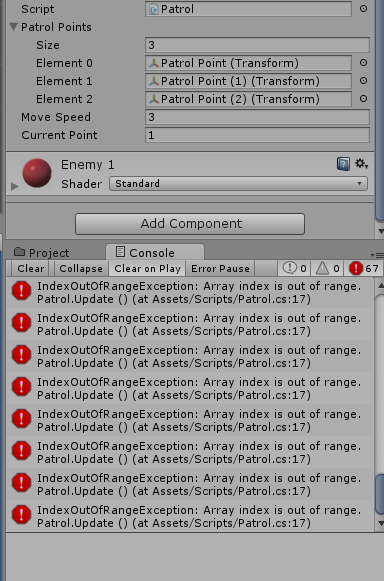 All prefabs are set in the inspector, see attached screenshot. It should be noted that the actual cube patrols correctly, resets correctly and generally behaves as expected. The only issue is this apparent exception that I can't figure out. because you did not initialize patrolPoints ! we can't read what is in patrolPoints.